-- and helps build good character at the same time! Basic game play is an easy and fast-paced card game similar to "Pit". Other variations include "Uno", "Memory", "Go Fish", "Old Maid" and "Taboo". Or make up your own unique way to play! 54 traditional card deck with spades, hearts, clubs and diamonds. Includes jokers. 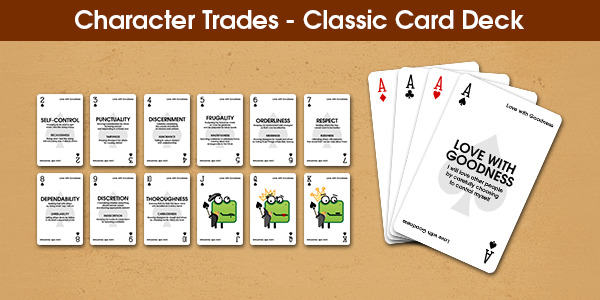 Each suit has a family of 9 character traits borrowed from the Character Trades card game.